In order to achieve success in trading binary options, it is imperative for a trader to stick to a certain strategy in his work. This is a set of rules for entering the market and closing the transaction, which is able to provide the player with the most profitable result. No need to think that the strategy should be too clever and confusing, on the contrary, many successful traders use a set of simple rules or indications of 1-2 classical indicators. For beginners, however, it’s better not to get involved in copyright strategies at all, but to choose a simple trading algorithm with low risks. 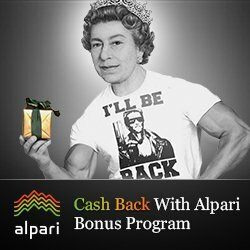 Such strategies, although they do not promise super profits, but provide a guaranteed opportunity to earn and not lose your deposit. One of these strategies is “average growth”. This strategy was originally developed for use in the Forex market. It was used in long-term trading, but with the advent of binary options, the strategy was upgraded to work with these contracts and already on medium-term timeframes. 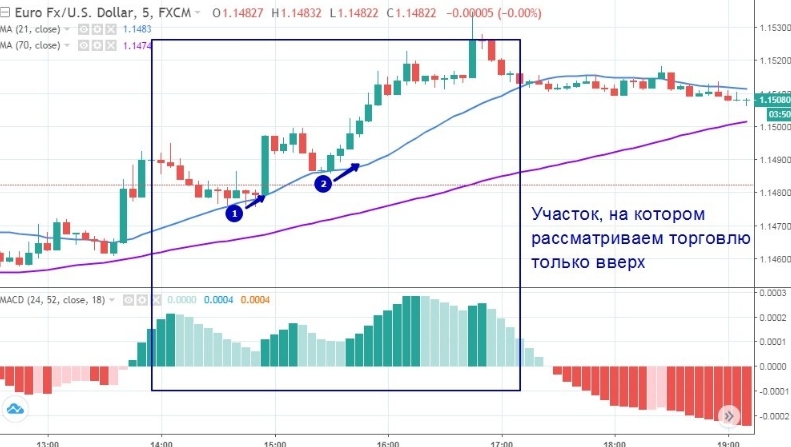 The strategy is based on the use of moving averages and MACD indicator signals, which confirm or refute the information obtained from the movings. Since the strategy was originally developed for the Forex market, it is not surprising that it manifests itself best when trading binary options on currency pairs, but you can choose any other asset from the stock of your broker as a base one. It is best to trade this strategy on a 5-minute chart, with the contract expiration term chosen for 1 hour. The strategy uses standard indicators, so you can work on any trading platform. For example, let’s use the Finmax broker extended charts, it has a large selection of analysis tools in its assortment that are easily customized and quickly superimposed on the price chart. Extended charts are freely available to everyone on the broker’s website, they help to carry out a qualitative analysis of the market situation, but in order to proceed to a deal, you must first open an account with the broker and deposit at least 100 USD for it. 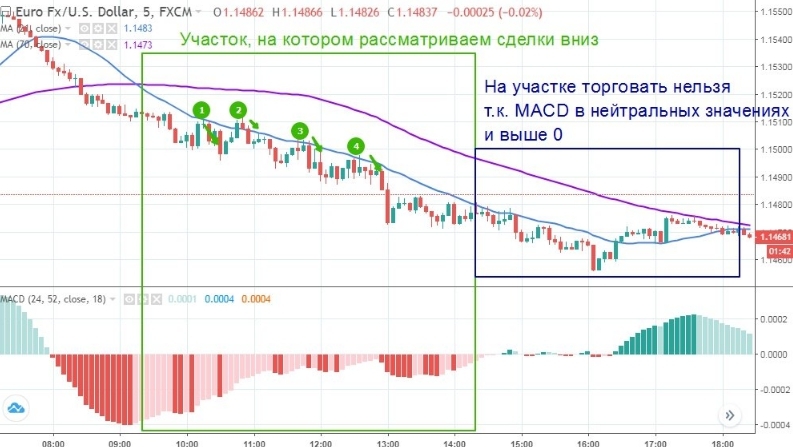 ● MACD (24, 52, 18) – the indicator is located below the price chart and has the form of a histogram, the columns of which are above or below the zero value. In our work, we need only a histogram of this indicator, the curves that complement it do not carry useful information. ● Blue Moving is above purple. If these conditions coincide, it is necessary to start searching for entry points. They are the moment when the price chart approaches the blue curve from the top downwards. The ideal option is to lower the quotes below the MA. As soon as this happened, you need to immediately switch to the Finmax platform from the extended chart and buy a binary option for a raise. Visually, the entry points on the extended chart will look like this. This example clearly shows 2 points for a successful conclusion of a deal to buy a call option. ● MACD histogram columns are below the zero bar. If the conditions coincide, then at the current market segment you can search for entry points. They are the moments when the price chart crosses the blue MA from the bottom upwards. Once this has happened, you need to wait for the candle to close, on the next candle, launch the Finmax broker platform and buy a Put option. As you can see, in this market situation there were 4 good points to buy a binary contract, each of which closed “in money.” Thanks to the MACD indicator, you can clearly see the areas of the market where the trade will be profitable, and where the signals of the movings are not confirmed. To check the effectiveness of trading according to the “Average Growth” strategy, it is enough to register on the Finmax broker website. In addition to a convenient platform and favorable trading conditions, the broker also offers many bonuses, useful tools and quality service.